Sensing impending defeat in next year's elections, the All Progressives Congress, APC, has urged the military to take over power if it becomes apparent that Peoples Democratic Party, PDP candidate, Alhaji Atiku Abubakar is winning the 2019 presidential election." The Acting Publicity Secretary of the party in Benue State, Mr James Ornguga made this comment while reacting to an online post. 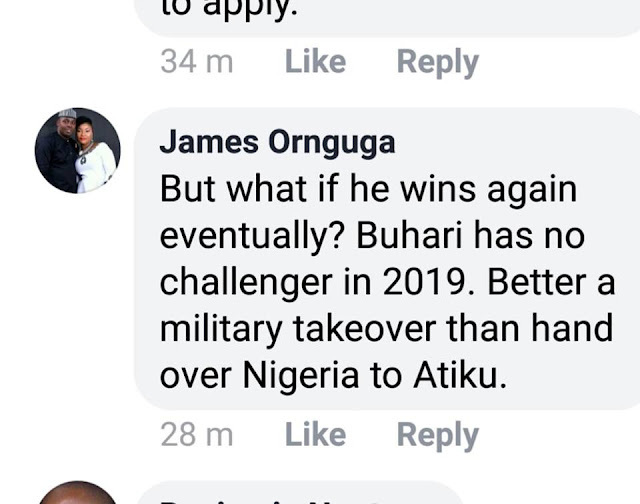 Mr ornguga said it is better Nigeria is ruled by military than have Atiku as President of the country. He said " better military takeover than hand over Nigeria to Atiku." The APC spokesperson called on the military to takeover power should there be indications of Atiku winning the 2019 presidential election. Mr Ornguga, said this is one of the strategic plans of the APC to ensure that PDP does not return to power. Ornguga's statement is considered weighty, unacceptable and a representation of the thinking within top circles of the Muhammadu Buhari administration. Many observers are of the opinion that the former military strongman may not concede defeat if he loses to his main challenger, Atiku Abubakar next year. The statement by the ruling party's spokesman in Benue State has fuelled such speculations drawing with it wide condemnations and calls for retraction as well as apology. Ornguga's comment has been described by analysts as reckless, unprofessional and a manifestation of undemocratic credentials of the party called APC under which leadership at the centre, thousands of Nigerians have been massacred by rampaging herdsmen, particularly in Benue and other states in the Middle Belt.